Stable Cottage, which sleeps 4, is a Grade II* curtilage listed cottage with an indoor heated swimming pool shared with other users of the Llanfendigaid site beside the sea at the southern end of the Snowdonia National Park. Loved our stay at stable cottage, we took our grandchildren they loved the pool and the cottage we visited zip world ,Barmouth and went pony trekking hopefully we can return very soon. We were absolutely delighted with our stay on the Llanfendigaid Estate, in Stable Cottage. The cottage was really a 'home from home', and we were able to relax completely without a care in the world. The cottage was very well appointed, and we had everything we needed, and we were able to do quite a bit of a elaborate cooking and baking! The bedroom was very calming, with a comfortable bed, and great shower next door. A particular highlight was the use of the heated swimming pool, which we very much enjoyed during our stay. The location was absolutely perfect; nestled in the hills, but very close to the sea, and also only 15 minutes' walk to the railway halt at Tonfanau, with easy access to Tywyn, Barmouth, Fairbourne, etc. The fields of newborn lambs surrounding the cottage were a delight (a definite benefit to holidaying at this time of year!). Graham was very friendly and on hand to help - great service. We will be back! Llanfendigaid is set in a tranquil rural setting close to the sea. It is free from background noise, light pollution and the local area (Tywyn & Fairbourne) provides a step back in time with livestock farming, forestry and a range of shops that provides very well for everyday needs. Stable Cottage provides a good standard of accommodation, particularly well suited to walkers and those with a dog. Adjacent footpaths and beaches are easily accessible. The centre manager is both welcoming and helpful; the information folder provided in the cottage is interesting. However, this would benefit from updating! There does not appear to be an inventory and although the kitchen is generally well equipped, the provision of just one small saucepan and the absence of a measuring jug was frustrating. Unfortunately, some aspects of basic housekeeping are overlooked, such as thick cobwebs in the fireplace, plug not working in bathroom sink, no cover on upstairs toilet and cupboard doors in need of adjustment! I will make further visits to Llanfendigaid, but the estate would benefit from a bit of TLC and attention to detail in order to reach the premier standards presented in the promotional ivideo and literature. Thanks v much for you review Michael and the points you make. We will get onto them without delay. Ill at ease in a big mansion, I felt instantly at home in Stable Cottage. A spacious porch lets you leave all your wet stuff (it is Wales) outside to drip in shelter. The broad hallway generously accommodates whatever might still be dry while discreetly allowing you to dive off into the toilet and washroom hidden under the stairs, before letting on to a well-equipped kitchen and sitting room to the right, or left up to the first floor. Here twin, generous double and bathroom are neutrally decorated. Clean, rustic simplicity with just enough comfort is the theme throughout - allergy sufferers will swoon with anticipation of a clean night's sleep without a rug, sheepskin, carpet or wing-back armchair anywhere within breathing distance. Well, I did. A heated towel rail and low-energy outside lamp are the only concessions to modernity, and well chosen. The night out there is darker than you remember if you're a city dweller, and you'll appreciate being guided back to your warm cottage with nothing but the steady wind in the pines for a soundtrack. 4th consecutive visit in Feb. Brilliant, cosy little cottage with lovely pool to use if weather lets you down. Graham always on hand for any help/advice. Lovely quiet tranquil location to sit back and relax. We stayed at the end of January the weather was kind to us stable cottage was lovely and warm had a great break..,very quiet with being winter, sun sets amazing walks to the sea shore 15-20 minutes. This cottage is the perfect mix of small cosy cottage and luxury holiday living. Very comfortable bed and everything you could ever need to make the perfect holiday. Loved snuggling up by the fire after a cold windy walk on the beach. Would 100% recommend! A lovely out of the way cottage yet in easy reach of attractions. The cottage itself has all the facilities required for a comfortable break away from home, including a good sized indoor swimming pool. We’ve stayed at Stable Cottage numerous times over the last 4 years and once again the experience lived up to expectations. There’s not much to say other than it’s a well appointed and well run property in a great location. We will be back! The sea, the mountains, cosy place in a remote area helpful and friendly staff: a perfect place to get away. This is a very tranquil spot, and the cottage is nicely furnished/designed. Nice pool facility too. Perfect for a family who don't mind coming off their gadgets for a bit and actually spending some quality time together outdoors or in. A bit isolated from civilisation, but this is part of the charm. Get to grips with the train and you will find this reduces a lot of driving. Great for a dog who loves chasing rabbits (and squirrels) but be careful around the sheep as they do bolt sometimes. It's also a bit of a shame you can't access the beach from the house; the railway line and erosion have made it too difficult. However, it's worth climbing the hill behind the house not only for the view, but to watch the red kites circle at their level. Couldn't have asked for much more! Had a fabulous week in the Stables Cottage with our 2 youngs boys. They loved exploring the estate and spent a lot of time in the heated pool! Not too far from the train and beach we had a lot on our doorstep and it proved a good location to explore the area. Had lovely BBQs in the garden with views of the estate. We had everything we needed and would stay again next time we come to Wales. A lovely, comfortable and tastefully furnished cottage taken as part of the whole Llanfendigaid Estate for a week. Perfect for two couples or a family of four with a dog either as part of the whole estate or individually. Great area with lots to do and tranquil surroundings. This is an amazing place to stay. The whole place is so peaceful and teeming with wildlife yet close to many local beauty spots. Graham, the manager, gave us such a wonderful warm welcome and the cottage was just a gem, a very quirky barn conversion which seemed deceptively simple but had absolutely everything we needed. We had a dog with us and there is a very generous totally enclosed garden with this property which was ideal. The pool which is housed in a stone building was a big bonus as the weather was warm and we made full use of it. Definitely one to visit! What a great week we all had in Dove cottage & Stable cottage, home from home feeling, everything we needed to make the stay comfortable, location was great, wildlife was great, from the nosey squirrel to the dove hiding away and playing with its plastic jug, great to see, on site staff were absolutely brilliant, the swimming pool was an added bonus, after being out all day it was great to come back and have access to the pool for a swim. We very much enjoyed the ‘Llanfendigaid Experience’ of being able to wander around the grounds and sit outside when it was sunny: the swimming pool was a bonus. Stable cottage was charming, comfortable and very clean. The beds and bedlinen were good quality and very comfortable. It did lack a few extra comforts, such as a cosy rug in the living room, better rugs in the bedrooms and the crockery, glasses and serving dishes etc were basic, there was a wooden fruit bowl but no salad bowl! Thank you to Graham and staff for looking after us. A cosy cottage with everything a family could need. The well equipped kitchen included an, unexpected, dishwasher as it wasn't mentioned on the property website description & a sizable fridge with small icebox for frozen necessities. The TV doubled as a radio when music was required. An onsite payphone resolved the issue of no mobile signal & using WhatsApp & email allowed people to contact us. We stayed here 22 years ago and have great memories from then. Since then we have found family locally and this makes it more special for us. Easy to get on the train if you don't want to drive. We have summer weather too! We loved the conversion, it was neat to be in a one room space for eating, talking and tv etc. Bedrooms were good as was the bathroom, plenty of light and loads of equipment - you could stay a year. Nice to have a big garden for dogs and lots of consideration for them. Our 3rd year at stable cottage and can honestly say we love it there. Lovely location and great , cosy little cottage with everything you need. Tywyn just a 3mile walk along the coastal path or 7-8 mins drive for anything else you need. The pool is immaculate and is of a perfect temperature all the time. rebooked already for next year. We have stayed at Stable Cottage numerous times as it never fails to deliver a great holiday for our family. Booking is simple, the location is great and the pool always amuses my daughter when she’s not wanting to climb mountains. For those that don’t know, the southern end of Snowdonia is a great place as there aren’t the crowds but one can still drive to the classic north Snowdonia are in about an hour. Great cottage in a superb location. Perfect for a holiday with our dog. Good local area and beaches for walking etc. well equipped and comfortable accommodation. Good sized sitting room. Safe access for my daughters at night from the main house. Well equipt cottage in peaceful Welsh location. Peaceful, fabulous walks nearby, well equipt, great heated swimming pool, very friendly and helpful staff, definitely visit again. Perfect for what we needed with everything we needed to relax. Excellent location & facilities. Sweet little cottage; a good refuge from the rest of the younger generations filling the main house! Great week in beautiful countryside! We've spend one week in the Stable Cottage. The cottage is spacious for 4 persons and provide enough capacity for luggage and clothes. The area around the cottage is really beautiful. The estate and the landscape gives you a feeling of living in the country in the past with the comfort of a new house. Graham, the property manager, is very friendly and gave us good support when we had problems with our car. The written guide for the area was useful. A cosy cottage in a converted farmyard. We enjoyed our stay and were very happy with the accomodation, although I do have the scars on my head to show for the low ceilings/door frames! There is no mobile signal at all in this location. Broadband (via satellite) is provided but is slow and can't be relied upon (we couldn't add more than one phone to it and it seemed to completely grind to a halt for days at a time - coinciding with the big house being occupied?) However, connectivity isn't generally why you would choose to holiday in such a rural location, so we just looked on it as part of the charm of the place. Our 4 year old loved the private pool which we had completely to ourselves. The beach nearby isn't great but Aberdovey isn't far away and is lovely. The train station within walking distance (even for a 4yr old - just) was very handy for heading to Barmouth or further afield, although with 2 or 3 rainy days in a row you find yourself doing 2hr+ round trips in the car in search of entertainment as the location is really quite remote. We had certainly exhausted most of our ideas after a week of mixed weather, although without small children would have happily stayed a few more days. Overall a very happy holiday was had. The cottage was brilliantly refurbished, with plenty of outside space and great facilities. We had highs and lows in terms of weather, but the accommodation provides all that you require, whatever the weather. We loved staying at this cottage. It was clean and well equipped, and we appreciated the dog bed and other items provided for our dog. Stair gates were very useful. There were plenty of cooking utensils. Graham and Will were really helpful and welcoming, all queries dealt with immediately. The surroundings are wonderful and it was a really relaxing holiday. The children loved the tyre swing, and we made good use of the swimming pool which was warm. We also used the BBQ and enjoyed being able to sit out surrounded by the hills and sheep. There is plenty to see in the area and the cottage is close enough to beaches, castles, walks and lakes. We also went on the steam railway. A useful addition for our large party, as used for those with dogs, which were not permitted in the big house. Looked well equipped for a small family. Few places can cater for 30 guests but this estate is one of them. Excellent facilities and location. This is the fourth week that we've spent at Stable Cottage over the last couple of years and once again this did not disappoint. As ever the pre arrive organisation was great and the site manager was on hand to welcome us. As is to be expected with a rental property, occasionally there needs to be running repairs i.e. A tap needed fixing and with was explained to us and dealt with promptly. We brought a dog with us this time and she loved exploring the area which is contained by tasteful fencing. Also a nice touch is that blankets were provided along with some other dog toys and a dog tag for say that the dog was staying at this address which was a nice touch. There's lots to do in the area especially if you are an outdoor type of person and the onsite swimming pool was a big hit with out 5 year old daughter. We've already booked for next year. We had a wonderful holiday staying at the lovely Stable Cottage. We had a lovely warm welcome, the location was perfect and the cottage was immaculate. The cottage was everything we were looking for, relaxing and cosy, and having a pool available was a huge bonus. I would highly recommend staying here, and will most definitely be returning. We took Stable Cottage as an addition to the house, as our family has become too large, and everybody still wants to come. It was a peaceful haven, where we couldn't hear the younger children waking in the morning. Great! A lovely cottage with good facilities, great for kids and dogs! Graham, who manages the site, is very friendly and helpful. The cottage was presented very well, was very clean, and the beds were excellent. Well equipped kitchen with excellent range cooker. A shower in the bathroom would be useful (although there's loads of hot water for baths) but there is a 'pay for' shower next to the swimming pool, the pool being shared with others. Kids loved the pool which was clean and warm. We had a wonderful week in Stable Cottage. The cottage is decorated to a very high standard and the kitchen facilities were very good. It was one of the more homely and relaxing cottages we have been in. Lovely walks for us and the dogs straight from the cottage. The pool was lovely and the kids really enjoyed it. It was a super base for exploring that part of Wales and there is a lot to do within a short drive. Graham was really helpful. Only shortcoming was the lack of a shower. Excellent stay and excellent location for exploring cardigan bay. Lovely cottage in a great location for exploring the Cardigan Bay area of the west coast of Wales. Huge comfortable bed in the master bedroom, with comfortable looking twin (although that was not used). Clean and functional bathroom, although no shower. Great kitchen with huge fridge and all the utensils and pots / pans you could need. Comfortable living room with board games, freeview and dvd player for any rainy days. Note of warning to anybody staying who needs to keep in touch with home / work - absolutely no mobile phone signal and the wifi advertised is limited to a certain amount of data. Pay as you go at £3 for 256MB once initial allowance is used. No phone signal on either EE or O2 and landline is password protected. Great indoor swimming pool. Asda deliver to the area, so well worth organising for your shopping to be delivered. Nearest shops are a 15 minute drive away. Enclosed garden advertised is on higher ground than the front entrance, up a series of uneven steps, so a little bit treacherous for anybody who is not steady on their feet or for very young children, but fine for the dog. Great downstairs utility room / toilet for washing clothes after messy days out! Would definitely recommend. Thanks for your lovely review and so pleased you enjoyed your stay. I'm afraid we are restricted to providing a broadband service via satellite which is only viable if we charge for using it. It is pretty fast (30mbs) which is good but theoretically can get through £5,000 per week! I'm still badgering BT and hoping that they will turn up with working broadband over a landline but no luck yet. I am shortly going to be installing enterprise call VoIP phones which I hope will sort out the telephone side of it at least by the time you return! My husband and I had a fantastic holiday at Stable cottage.Beautiful surroundings,cottage was everything we hoped for in comfort location cleanliness very well equipped with the bonus of the lovely pool.Graham was on hand if needed and very helpfull and friendly. This review is far to long and to expect someone to write a long review of each house when they have rented the big house and all the cottages is unfair and will put people off as it did me. I have no wish to write four lengthy reviews even though the place is excellent. Once again another wonderful stay. My family and I returned to Llanfendigaid for a short break at the end of the Easter holidays. Once again we loved our stay; the swimming pool being a great hit with my two young boys and scootering down the road everyday. Toasting marshmallows over the fire pit whilst the sun was setting was just delightful. A great spot with a wonderful coastal cottage, we shall definitely return. Thank you to your team. Our recent stay at Stable Cottage, Llanfendigaid was wonderful. Our party consisted of 3 adults and 2 dogs and it suited all of us. Upon arrival we had a lovely welcome and Graham was very helpful throughout our stay. Stable cottage was comfortable and perfectly homely and we settled into relaxation mode straight away and had fun exploring the gardens and taking in the most beautiful setting. Walking down the lane to the beach just hit all the senses! The fact that there is also a small train stop so near is just an added bonus, either for getting around or for simply enjoying a train journey. A very special place and it suited all of us, and we would definitely like to go back again - soon!!! Good accommodation for the dog. A secure, garden allowed us to feel secure that the dog was content when we were absent. Beds were comfortable, kitchen well equipped. Sitting area cosy and welcoming. Pool a little cold and some children had sore eyes. A perfect location for a quiet getaway with pool and beach on hand. The accommodation is done nicely. However the thoroughness of the cleaning prior to our arrival wasn't great. The owner did address this as soon as I rai it as an issue. 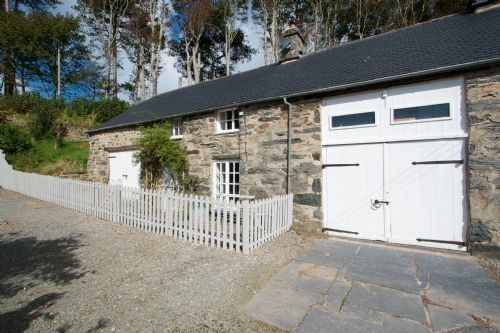 Stable Cottage was a comfortable and spacious property in an idyllic location. Graham was a great host, very helpful and friendly. I would recommend this property to others. This is our thrid visit in the last year and it again left us with many happy memories. The experience offers great value for money in a cracking location. The property is situated in a lovely area and our 3 year old really enjoys being able to explore. We'll be back! Stable cottage was used by my youngest daughter and her husband, and they really enjoyed their stay. The beds in all properties were extremely comfortable. We enjoyed the "shabby chic" decor. We stayed at Stable Cottage for 5 nights just as 2014's Indian Summer coming to an end. Not so good things: no shower (difficult to wash hair), weak/slow internet access, wild storm caused temporary power outages but log fires keep working. Don't know if we'll come back but would like to. This is our second visit this year and we didn't think twice aboiut rebooking as we and our 3 year old daughter loved it and the surrounding area. Stable cottage is well appointed and comfortable and the onsite swimming pool is great for our daughter. Lovely cottage and location perfect. Lovely walks on your doorstep. A short drive to pubs/restaurants. Really enjoyed our stay and will stay again. Stable cottage was perfect for our dogs with no escape routes in the garden and plenty of space. The cottage was fine. It could have been a lot cleaner. The kitchen and bathroom were clean. There were clumps of dog hair under the bar stools which I vacuumed, a dirty tissue under the sofa and a lot of cobwebs and both dead and alive spiders. Their cleaners need to move things when cleaning and not just clean around them. I hadn't realised that there was no table and chairs to eat at - just a kitchen counter and bar stools. Not practical with a 4 year old although the property is marketed as family friendly. The swimming pool was okay but no facilities to change or shower at the pool. The water was also a bit on the cool side which put us off using it. Graham was perfectly friendly and helpful. They have recently put a new oven in and need to invest in some new oven trays as the ones in the cupboard don't fit the oven. We stayed in the cottage as part of a larger (21 bodies) group in the main house. This was a re-visit from 4 years ago having stayed at Llanfendigaid for 10 years running in the late 80's and early 90's. We now have children's partners and their own children in tow !! Another great week, the weather behaved itself (mainly) and all the childhood attractions were returned to as well. Tonfanau Beach BBQ, Aberdovey beach, the train, estuary walks, Cader Idris, and golf at Aberdovey. The accommodation was brilliant and we approve of all the modernisations undertaken but in keeping with the original character of the house. The swimming pool is an added bonus and a boon when trying to keep youngsters occupied. The wifi is slow but this understandable given the area. The stable is well equipped with good quality items. Super location. Beautiful property. Kids loves the pool. Our own cute garden. Great walks on the beach. Fun flagging down the train. Wouldn't hesitate to recommend a visit! It was a bit of a punt in the back when we booked this place as it was done entirely from the website/ internet. However as if fitted the criteria of 'woodburner/ wifi' and the reviews seems good, we paid our money. In short it was a cracking find set in a beautiful area. We stayed in Stable Cottage which we found to be very comfortable and equipped to a good standard. The facilities are very good and our young daughter (2.5 years) loved running around exploring. The owner (Will) and the site manager (Graham) were very helpful and were keen to make sure that we enjoyed our stay. It would appear that a 4 property will be added soon as one of the outbuilding is being converted into another holiday let. In short and with a nod to 'Arnie': we'll be back! The most perfect cottage. Perfect location. Clean. Everything you could wish for. Warm. excellent facilities. Pool lovely. Estate manager very helpful. Dog friendly. The Stable Cottage was rented along with Llenfendigaid Estate. This was meant to put our two sets of friends who flew all the way from Washington DC (top exec from IMF) and his partner who flew all the way from the Philippines to celebrate with us our wedding anniversary. Another couple joined us for just a night, brought their 1 small lovely, well behaved dog. The cottage behind our property was meant to separate them from the noisy children, and give them privacy. They loved everything about the Stable Cottage. Modern and well kitted. They had a lovely time walking around the area and took many lovely photographs. They joined us during meal time and during the day, they explored the nearby places by car. In the evening, it was nice to have wine, cheese and crackers as we chatted by the fire place with soft music in the background, or played scrabble at the dining room. They had fun and privacy unplugged at the cottage! Just a beautiful place to stay. The cottage is so very comfortable and delightful in the evenings when the woodburner is going. Would highly recommend this place to anyone. I think we may well be coming back!